The sun has permeated the frozen winds of Blashrykh and finally, brand new Immortal shall see the light of day this July! Raise you battle axe in honour, corpse paint at the ready! 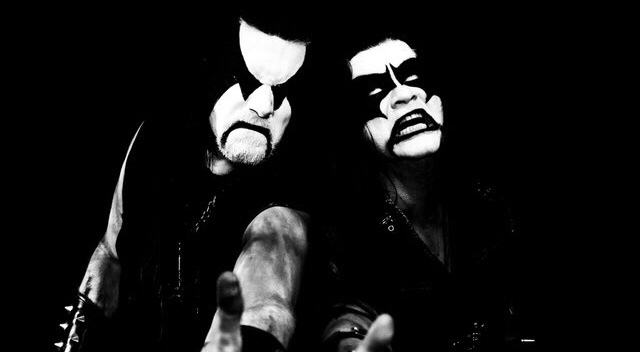 One of the best Black Metal bands of all time, Immortal are and always will be one of my all time favorite acts to come out of the Black Metal scene. Aside from their hilarious promo videos which feature every Black Metal cliche under the sun, their material is some of the most solid riffing in the genre. Now, many years after their All Shall Fall release, the band will return with a brand new album Northern Chaos Gods. Following on from the absolutely amazing artwork by Par Olofsson on their All Shall Fall release, Immortal’s brand new artwork recalls a bit more of a classic take on the Immortal visuals and I think its going to be absolutely amazing! The band returned with long esteemed producer PeterTagtgren once more to deliver the new album and the title track and new single “Northern Chaos Gods” will be released on limited edition 7″ May 25th, whilst the digital version of the song will be made available May 11th. With all pre-orders of the album going live on May 11th so make sure that those pockets are full! What do you guys all think? Preorder the 7″ here!